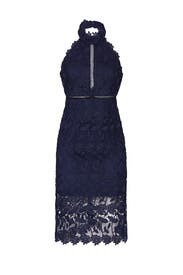 Navy lace (100% Polyester). 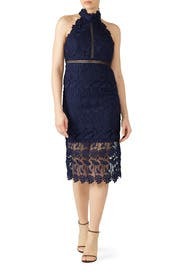 Sheath dress. Sleeveless. Halter neckline. Hidden back zipper closure. Partially lined. 43" from shoulder to hemline, 8.5" Slit. Imported. I didn't wear it. If you have curves, it'll fit very straight. The top was large and waist was large but hips small. Loved the for, made me feel like a million bucks. Needed the right bra for the dress so I couldn't be seen.